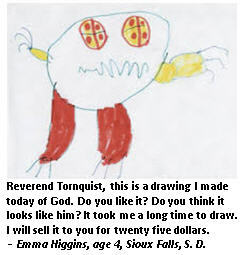 Reverend Tornquist: I see we have a question from Sophie. Hello, Sophie. How old are you? Sophie: Hi, Reverend Toadkiss. I’m four years old. Tornquist: That’s Tornquist. An understandable mistake. Sophie: Whatever. I wanted to know – Is God left-handed like me? Tornquist: What an interesting question, Sophie. I really don’t know. I will have to pray about that one. Sophie: So what you’re saying is you know nothing about God. How did you ever get to become a priest? Tornquist: Actually, Sophie, I’m not a priest. I’m a minister. I see that Billy has a question. Go ahead, Billy. How old are you? Tornquist: Actually it’s Reverend Tornquist, Billy. What’s your question about God? Billy: I want to know, where does God go to the bathroom? 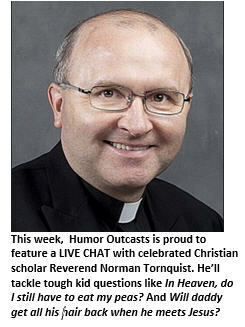 Tornquist: Another fascinating question. Thank you, Billy. Well, God is all-powerful. So, I guess he can go to the bathroom anywhere he wants. When it rains in the forest, maybe that’s God’s way of peeing. Billy: Wow, I had no idea God had to pee so much. Maybe he has a tiny bladder. Sure hope my parents never make me go on any more camping trips. I never knew how gross the outdoors was. Thanks, Cardinal T.
Tornquist: It’s Reverend – Never mind. Let’s take another question, shall we? I see Angel has a question. What a lovely name, Angel. Do you have wings? Angel: Not anymore. My mommy took away my angel costume because I threw her cell phone in the poopy seat. She’s still mad at me for that. Tornquist: I am sorry to hear that. What’s your question, Angel? And how old are you? Angel: I’m three. Last night I overheard my mommy in the bedroom shouting “Oh, God!” and “Yes, Yes, Yes” over and over. Do you think my mommy was talking to God last night? Tornquist: Um, in a way, maybe. Maybe God was coaching your mommy and daddy on how to make a baby. Angel: My daddy was out of town last night. But his brother was here. Do you think mommy and Uncle Carl were trying to make a baby for daddy? Yippee! Maybe I’ll get a baby brother. Can I name him Eddy, after my guppy? Tornquist: Um … er… um…. Let’s hear from James. What’s your question? James: Hi, Mr. Thorn-squished. I want to know why they gave Jesus a timeout up on that pole. Was he being naughty? Did he talk back to his daddy or something? Tornquist: Ah, James. Jesus was not being naughty. He was dying for our sins. His father loved him very much. James: His daddy sure had a strange way of showing it, if you ask me. When my daddy tells me he loves me, he usually buys me ice cream. He would never give me a timeout on a pole. Tornquist: Did you know that Jesus’s father is God? God loved Jesus very much – just like he loves you. James: Uh oh. Does that mean he’s going to give me a timeout on a pole, too? Tornquist: Not to worry, James. I think you’re safe. I see we have a question from Tony. It says here you’re seven. What’s your question, Tony? Tony: My kitty cat Patches died yesterday. I am very sad. Will Patches go to Heaven even after peeing on the carpet? Tornquist: I am sure Patches will go to Kitty Heaven. She is in a good place now. Tony: Oh no! God turned Patches into a girl?!!!? This is the worstest thing ever. He was such a great boy kitty. And now God turned him into a girl? How come? Is God going to turn me into a girl when I die? Tony: First God puts his boy on a pole and now he turns my kitty into a girl. I don’t think I like God very much. He’s a very mean man. Tornquist: Um, he’s actually very nice. Trust me. Let’s take another question. How about Anna, age five, it says here. What would you like to know about God? Anna: Last week my daddy ran a stop sign and smashed into another car. The other driver got out of his car and started screaming at my daddy. He yelled, “Jesus Christ. Didn’t you see the God-damned stop sign?” My question is this: Is my daddy really Jesus? Tornquist: I don’t think your dad is Jesus. Anna: Are you sure? Because I think it would be really fun if my daddy was Jesus. Can you ask God? But tell him my daddy is sorry about the accident so that God doesn’t give him another timeout on a pole, okay? Tornquist: I’ll put in a word for your dad, Anna. Thanks. I think we have time for one more question. It comes from Harold. Go ahead, Harold. What’s your question about God? Harold: Was Jesus a communist? Tornquist: I’m sorry, Harold. Come again? Harold: Was Jesus a Commie? Because he was always telling everybody to share their toys and their bread and stuff. My dad says Jesus was a Communist. Harold: My dad says that millions of Americans sit on their asses and expect the government to take care of them with welfare checks, and that before long, this country will become a crippled, dependent, socialized welfare state like 1930’s Stalinist Russia, putting an end to free enterprise and personal responsibility. Tornquist: I was just saying that Jesus taught us to share with the less fortunate. How old did you say you were, Harold? Harold: Six. I like turtles. Tornquist: Very nice. Well, that’s all the time we have this week for Kids, Ask Me about God. Till next time, remember, kids. God loves you, even if you wear braces. Why did King David play the liar so much? Whatever happened to Gladly, the cross-eyed bear?